Our external composite back doors are manufactured to a very high standard and specification, achieving a super strong and secure back door that will leave you feeling safe and secure. Choose from a superb assortment of composite back doors in a variety of exterior back door styles and upvc frame colours. We understand security is paramount at the rear of the property and as standard we install a Police preferred PAS024 approved multipoint locking system with expectional security features and a Yale kitemarked cylinder. In addition, our composite back doors offer excellent thermal efficiency and weather resistance. Buy with confidence from the UK's No.1 rated composite door supplier on product and service. 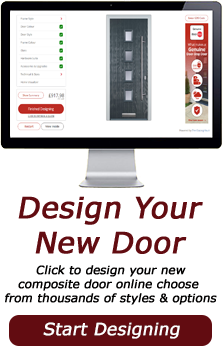 Exterior back door prices start from just £459 inc VAT DIY supply only, fantastic value rear doors and of the highest quality and specification, delivered 'FREE' right to your doorstep and within just 5-9 working days*. Contact GRP Composite Doors UK today on 01530 515160 for further information on our back doors and lead times.